Founded in 2008, SCTR’s all volunteer staff work to acquire their equine residents primarily from low end auctions where horses can be at an increased risk of exportation for slaughter. On occasion, SCTR will also take a Thoroughbred from animal services usually as part of a starvation or neglect case. When a new horse arrives at SCTR they are immediately placed in quarantine for 30 days. “Auction horses are at a high risk for exposure,” said Betts, “and in most cases, we do not know anything about the horse’s history.” While in quarantine horses are wormed, vaccinations are administered, teeth are floated and a thorough vet exam is performed. If needed, x-rays are taken all in effort to develop a rehabilitation plan for the horse. “Rehab can take months, especially in starvation cases,” shared Betts. Once a horse is fully rehabilitated they are enrolled in SCTR’s retraining program. 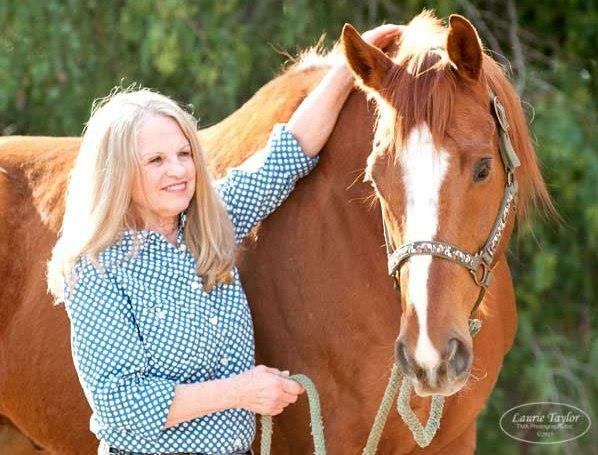 SCTR utilizes the services of two professional trainers, Glenda Snow and Lisa Headley, who work with the horse from the ground up with each horse remaining in training until they are adopted. SCTR averages about 20 horses in their program at one time, and all are at varying stages of rehabilitation and retraining. Betts credits SCTR’s retraining program for creating a permanent safety net for SCTR adoptees. In recognizing that most adopters were novice, pleasure or amateur riders, Betts shifted the focus of the retraining program to ensure that SCTR’s horses were prepared for these owners. “We will only place more horses if more horses are qualified,” she shared. Betts recalls a recent experience where a first time horse owner and novice equestrian wanted to adopt a mare from SCTR. “Rather than dismiss her as unqualified we recommended that she take horsemanship and riding lessons prior to our releasing the horse, and propose a concrete riding and training plan for the horse following adoption. It is important to invest in potential adopters as expanding the number of qualified homes is essential,” she said. This philosophy has seemingly succeeded as adopted horses are rarely returned to SCTR. Snow’s keen knack for matching adopters with appropriate horses as well as SCTR’s extensive adopter screening process are also acknowledged as vital for creating successful adoptions. Betts, a native of Surrey, England manages the daily business activities of SCTR in addition to her full-time research and teaching position as a tenured Associate Professor of Economics at the University of Southern California. When asked what she considers to be the biggest success of SCTR Betts responded, “being stable and still being in operation after nearly seven years.” “Non-profits and new organizations in general have a high failure rate so being able to chug along is huge because of what it does for the horses that come into the program.” She also acknowledges that new sources of funding within the Thoroughbred industry earmarked for horse care have allowed organizations like SCTR the opportunity to fundraise for capital and program improvements. SCTR has received a grant from TCA for the last several years. Betts shared, “TCA’s grant is incredibly important to us. It helps fund the care of our horses which is the biggest chunk of our expenses.” TCA is proud to support SCTR and the many other organizations working on behalf of Thoroughbreds.